~Tableau Vivant~ Halloween Edition skins, new hairstyles and a group gift! Hello gentlemen and ladies, bored of us yet? We hope you aren’t because this post is full of cool new releases! Halloween is almost upon us and for this reason we have released some “Vamped up” versions of our David and Lucis skins at a special price. We treated the guys with special spooky makeups to perfectly match your costumes. Each skin has 5 different makeups to choose from, in each package you will also find three eyebrow options: dark, brownish red and blond. Please note that David and Lucis Horror edition come only in the bald version. We have some hair out too to match with your skins! ~ Tableau Vivant~ Vlodovic hair is a straight but voluminous hairstyle that will look great on a vampire inspired look but also on your your everyday looks. Just for the ladies, ~ Tableau Vivant~ Bardot hair is an homage to the most famous and sexiest French actress. This timeless hairdo screams date night and will turn each of you into a real bombshell. We also have a new groupgift out for you guys! 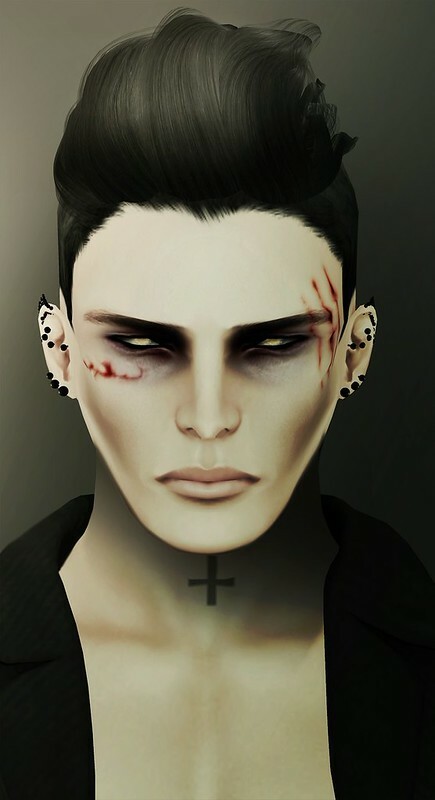 There’s a new Halloween inspired makeup of David and Lucis up for grab on the skins counter. Three eyebrows options for both as well! ~ Tableau Vivant~ group tag on! Posted on October 21, 2013 Author Mavi BeckCategories NewsTags Bardot, group gift, Hair, Halloween, Halloween skins, Skins, VlodovicLeave a comment on ~Tableau Vivant~ Halloween Edition skins, new hairstyles and a group gift! We are part of Cosmetic Fair, running from Oct 15th to Oct 31st. Unisex hair piece and finally all the hairbases are done! Inside the pack you will find tubes with the hairbases, 14 per hud color (70 in total + 14 renamed to match the mixed Equinox hud). Talamasca hairpiece is non rigged so you can resize it. Since the head shapes are all different we improved the resize with a new script, you can stretch now in all XYZ directions. Just touch the hair, no need to use the hud. We are finally starting our mesh beards collection since our system beards are so old! Here is the first one, we hope you will find easy to fit it on your shape. As for the hair you can resize it in all X, Y, Z directions, any of them, just touch the beard and follow the blue pop-up menu. 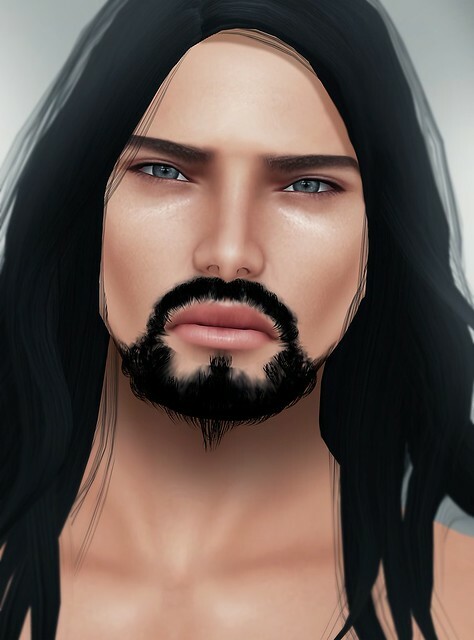 Both the mesh beard and the facial hair layer are tintable, just edit and pick the color from the SL color window. – Pose stand with pose on/off buttons. – Restore button will reset the beard in the original size. – You can delete the script to reduce lag but please remember to do a copy of your hair first. Thank you fo your time and please remember to share your gorgeous pictures in our flickr group! We are taking part to the Body Modification Expo with a special new release! Dreamscape Hair is a special hairstyle that can be worn in several ways. The pieces ‘Horns’ and ‘Blindfolded’ are unrigged mesh, so they can be resized via hud. A system hairbase layer is provided to match the Horns hair piece. The HUD allows to make the scalp of the Horns piece invisible; this way you can wear the horns only. You can also delete the script. It will *not* make the hair mod so please, save a copy before you remove the script! Please note, the hair comes in this single reddish brown/black color, exclusive for BM. News from Tableau Vivant! And get ready, there will be a lot this month! Let’s start with our new Collabor88 release: Kawashima I Hair, a unisex medium wavy hairstyle. The hairstyle is unrigged so you can resize it via hud. In each pack you’ll find 4 versions: 2 regular (male and female) and a v.2 (male and female). v.2 features some extra locks, it’s the only difference. Fat pack: all 6 color huds. Poses, poses and more poses! This month Loulou has worked really hard! She did 41 poses for She&Him: 20 single poses for ladies, 20 poses for gents and a couple pose. Bundle packs of 20 poses each available! As always her inspiration comes from music (as you can guess from some titles) and she focused a little more on male customers that kindly requested more gents stuff!